Mecklenburg Automotive & Collision Center has been providing quality automotive repair services in Charlotte, NC since 1996. We are a family owned business delivering honest and professional automotive services to Charlotte and the surrounding areas. Mecklenburg Automotive mechanics in Charlotte use only the highest quality products, including Dupont Automotive Coatings. We are a Jasper Engine & Transmission authorized warranty repair shop, and we are also an authorized Goodyear Tire dealer. No matter what kind of work your personal or company vehicle needs, our team has the knowledge and resources to get the job done. From dents and dings to major body repairs and restoration, we are experienced with it all. We have experience working with all makes and models, foreign or domestic. We are the definition of a one-stop-shop! You can keep your vehicle’s engine in good working order by planning ahead, and by allowing the trusted mechanics at Mecklenburg Automotive & Collision Center to perform your routine maintenance. One thing you can’t plan for, however, is a car accident. Wouldn’t it be nice if the same trusted mechanics in Charlotte who did your engine repairs could also do your body work? Yes. And you guessed it, we do major and minor auto body work repairs too. We realize how convenient this service is for our customers. Collisions that result in the need for body work often need automotive repairs as well. 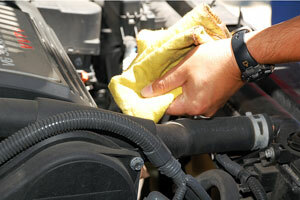 All of your vehicle’s necessary services should be handled in the same shop. Who has time to search for, find, and drive across town to a body shop that you think might be good? Instead, just stay at our one-stop-shop and get all your car repair needs taken care of. Transmission repairs are complex and can be very difficult for inexperienced mechanics. Many novice technicians will take apart your transmission unnecessarily. Of course, that will cost you an arm and a leg. Bring any trouble with your transmission to us first. Our trained Charlotte auto service technicians are able to install a new or rebuilt transmission whenever needed. Both automatic and manual transmissions are handled with the same expertise, as all engine repairs. We repair and replace vehicle engines on all makes and models. One of our priorities is saving you money. And we do this by helping you avoid costly repairs. Call us today for the best collision, transmission, and automotive repair Charlotte has to offer!